Ellis the Elephant dives back into history! In Yankee Doodle Dandy, the third installment of this New York Times bestselling series, America's favorite time traveling pachyderm is back, teaching kids (and parents!) about the American Revolution. In Sweet Land of Liberty and Land of the Pilgrims' Pride, Ellis the Elephant explored pivotal moments that shaped American history. Now Ellis is back, … and eager to learn about Americas most beloved patriots and their courageous fight for independence. Traveling through time, Ellis the Elephant encounters the Sons of Liberty, Patrick Henry, Paul Revere, the Founding Fathers, Betsy Ross, and more. 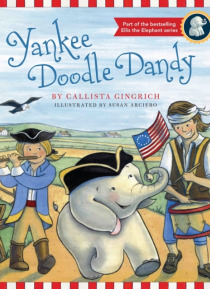 Authored by Callista Gingrich and illustrated by Susan Arciero, Yankee Doodle Dandy educates and entertains as Ellis the Elephant experiences the American Revolution. With beautiful illustrations and charming rhymes, Yankee Doodle Dandy is a must read for young and old alike who want to know how America became a free and independent nation.